We have already seen the Metal shading language in action in previous posts. In this post, we introduce a new kind of shader function: the kernel function. Kernel functions allow us to build massively parallel programs that operate on many pieces of data at once. I will use the terms “kernel function”, “compute kernel”, and “compute shader” interchangeably. A kernel function is identified in shader source by prefixing it with the kernel keyword, just as we prefix other types of functions with vertex or fragment. One difference between these types of functions is that kernel functions must return void. The following snippet is an example of a kernel function signature. The new attributes introduced in this function signature will be discussed in detail later on. Building the compute pipeline is similar to building the render pipeline for our work with 3D rendering. Instead of a renderer class, we create a context object to hold onto various Metal objects. The context wraps up the device, library, and command queue, since these are long-lived objects that will be referenced by every filter. The context class has a very simple interface. Calling the +newContext factory method returns a context with the system default device. There is one serial command queue per context. This allows us to serialize work items, such as image filters that may have data dependencies between them. Building a pipeline state for executing kernel functions is a little bit simpler than creating a rendering pipeline. There is no equivalent to the MTLRenderPipelineDescriptor for compute pipelines, because the only configurable part of the compute pipeline is its associated kernel function. The compute pipeline is then created by asking for a compute pipeline from the device. If an error occurs when compiling the kernel function for the target hardware, the error will be returned in the error parameter, and nil will be returned. Before sending work to the GPU, though, we need to understand how to configure the compute command encoder’s argument table and how to dispatch threadgroups. We’ve used the argument table in previous articles, but never referred to it by name. The argument table consists of all the state we configure on a command encoder, grouped by type. For example, the argument table holds the lists of textures, samplers, and buffers that eventually become parameters to our shader functions. For example, we configured the arguments of our fragment shaders by calling the -setFragmentTexture:atIndex: method on a render command encoder. The index parameter matches up the entry in the argument table to the parameter with the corresponding attribute (e.g., [[texture(0)]]) in the signature of the fragment function. There is a similar method for setting up the argument table for compute encoders: -setTexture:atIndex:. We will use this method to set up the argument table when preparing to execute kernel functions. Threadgroups are a central concept in Metal kernel function programming. In order to execute in parallel, each workload must be broken apart into chunks, called threadgroups, that can be further divided and assigned to a pool of threads on the GPU. In order to operate efficiently, the GPU does not schedule individual threads. Instead, they are scheduled in sets (sometimes called “warps” or “wavefronts”, though the Metal documentation does not use these terms). The thread execution width represents the size of this unit of execution. This is the number of threads that are actually scheduled to run concurrently on the GPU. You can query this value from a command encoder using its threadExecutionWidth property. It is likely to be a small power of two, such as 32 or 64. We can also determine the upper bound of our threadgroup size by quering the maxTotalThreadsPerThreadgroup. This number will always be a multiple of the thread execution width. For example, on iPhone 6 it is 512. To make the most efficient use of the GPU, the total number of items in a threadgroup should be a multiple of the thread execution width, and must be lower than the maximum total threads per threadgroup. This informs how we choose to subdivide the input data for fastest and most convenient execution. Threadgroups do not have to be one-dimensional. It is often convenient for the dimension of the threadgroup to match the dimension of the data being operated on. For example, when operating on a 2D image, each chunk will typically be a rectangular region of the source texture. The figure below shows how you might choose to subdivide a texture into threadgroups. 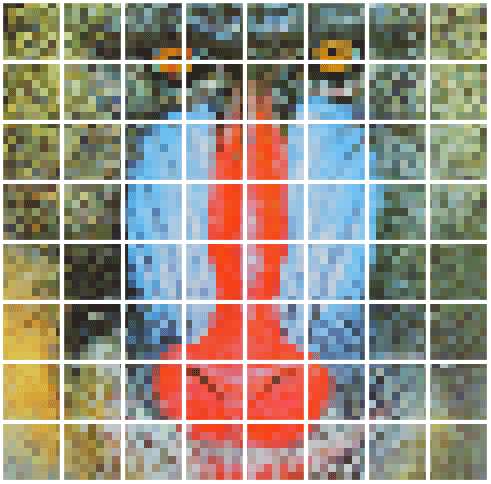 An image to be processed is divided up into a number of threadgroups, represented here by white squares. Here, we somewhat arbitrarily choose a threadgroup size of eight rows by eight columns, or a total of 64 items per threadgroup. We make the assumption that textures being processed by this code will have dimensions that are multiples of 8, which is often a safe bet. The total threadgroup size is an even multiple of the target hardware’s thread execution width, and is safely below the maximum total thread count. Now that we have determined the size of our threadgroups and how many we need to execute, we are ready to dispatch a compute call and put the GPU to work. Encoding a command to execute a kernel function on a set of data is called dispatching. Once we have a reference to a compute command encoder, we can call the -dispatchThreadgroups:threadsPerThreadgroup: method to encode the request for execution, passing the MTLSize structs we computed previously. Once we are done dispatching, we tell the command encoder to endEncoding, then commit the corresponding command buffer. We can then use the waitUntilCompleted method on the command buffer to block until the shader is done running on the GPU. The kernel function will be executed once per data item (e.g., once per texel in the source texture). In this brief article, we have laid the groundwork for a discussion of high-performance image filtering in Metal, as well as other applications of data-parallel programming. You can read this article’s companion post, Fundamentals of Image Processing, for much greater detail on how to put these principles to work. That article also contains a sample project featuring all of the code from this post. Thanks for being so generous in giving me credit. It was a lot of fun to follow along as this app developed. Here’s a direct App Store link for the curious. Currently you’ve written, “You can query this value from a command encoder using its threadExecutionWidth property”, but these are actually properties of MTLComputePipelineState. On the iPhone 5S / A7, they’re 32 and 512, respectively. Oops! Forgot to mention maxTotalThreadsPerThreadgroup. Comment doesn’t make sense without it. This tutorial corresponds to chapter 13 of your book. You wouldn’t happen to have an example project that puts this code to work? Hey, Rudolf. There’s no sample project for this post/chapter because it was mostly a preface to the subsequent post/chapter. Does the number of thread groups affect performance? For example, would `MTLSize threadgroupCounts = MTLSizeMake(1, 1, 1);` be just as fast? I read that in CUDA land, each thread group is assigned its own processor, and I’m wondering if a similar paradigm applies to Metal. In my own experiments, I haven’t noticed much of a performance difference when arbitrarily changing the number of thread groups. I understand that thread groups can be used for synchronizing access to memory (via `threadgroup_barrier`), but I haven’t been able to find any evidence in the Metal documentation that there’d be any performance benefits. The number of threadgroups multiplied by the threads per threadgroup determines the size of the “grid” to be dispatched. If you reduce the number of threadgroups without changing the number of threads per threadgroup, your kernel function will just be invoked fewer times. As for tuning threadsPerThreadgroup, a given compute pipeline state has an associated number of threads that can actually be executed in parallel (its threadExecutionWidth property). If you make your number of threads per threadgroup a multiple of this, you’ll avoid wasted work and utilize the GPU more fully than otherwise. Huge help for a beginner. Trying to understand the purpose of a thread group – I had thought it meant it ran on a separate core in the GPU but now not so sure. Lets say my GPU has max threads per thread group as 512, and a width of 32. Suppose I want to use 512 threads. If I put them all into one thread group, is the performance the same as if I have 16 thread groups, each with just 32 threads? Hi warren,is it possible to pass 3 dimensional array to kernel shader function? because i want to pass a list of list of float4x4 in MTLBuffer and want to access one list of float4x4 per thread at time in my kernel shader. Unfortunately I don’t think multiple levels of indirection are supported in buffer parameters, so you’d need to lay out your list (of lists) contiguously in memory and devise an indexing scheme based on the thread ID and dimensions of the array. Thanks for the article Warren!